Your strengths. Your passions. Your degree. Sometimes you need room to grow in your own direction -- to learn what you want to know, to become who you want to be. CoLA undergraduates can choose to build their own bachelor of arts (B.A.) or bachelor of sciences (B.S.) degrees using the University Studies major. This degree tool offers a passage to receiving a formal liberal arts degree from Southern Illinois University without a declared major. The University Studies program is the way to build a custom bachelor's degree based on the needs and interests of a particular student. It is a broadly based degree that not only allows, but requires, diversification. Some University Studies students create their own degrees as an avenue of preparation for a work force where well-rounded knowledge of science, social science, humanities, fine arts and technology is required or preferred. Others use their University Studies degree to prepare for graduate or professional programs of study later. Earning a real, tangible bachelor's degree from Southern Illinois University Carbondale opens many different doors for your future. 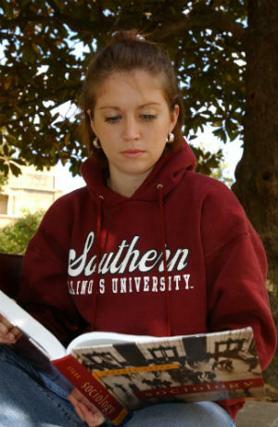 Contact us to learn more about earning a University Studies degree from SIU Carbondale, and what it can do for you. To be admitted to the University Studies degree program, a student must have completed at least one full year of college course work (a minimum of 24 semester hours) with a 2.00 grade point average or higher. Students who have not yet completed their first year of course work can meet with the program director before then to discuss a plan of study, but cannot declare a major until they have completed the required number of hours. Once a student declares a major in University Studies they must create a plan of study. A student will complete either a Bachelor of Arts or a Bachelor of Science degree. Each approved plan of study will culminate, during the last semester of studies, with a reflexive essay which assesses both the program and the customized degree earned by the student. Browse popular SIUC online course groupings that are compatible with your University Studies degree. Earn your University Studies bachelor's degree at our Carbondale campus in the heart of Southern Illinois.